THE TECHNOLAWGIST LAW. TECH. FUTURE. At The Technolawgist we are joining the celebration for Women’s Day, by sharing the stories of extraordinary women across the world leading the Legal Tech sector. Each and every one of them is the inspiration and the living evidence that transformation in the legal industry is possible and that innovation flourishes in every corner of this planet. It was a very natural transition, I discovered that what I really wanted was unleashed the entrepreneur that I had always been. I practiced law at one of the leading Spanish law firms, Cuatrecasas, and after living many years abroad, mainly in Brazil and the United States, I wanted to return to Spain. Then I got involved with the world of entrepreneurship in Valencia, my hometown. We realised there was a great business opportunity in the Legal Tech sector, seeing what was being done in the United States and knowing that in Spain there was no similar projects. I decided to found Bounsel, an intelligent platform driven by AI for the integral management of contracts. Being able to build a powerful SaaS tool from a technological standpoint aimed at B2B and, in particular, large corporations, so that legal departments can do their job better. We seek that our tools empower legal departments and help them be able to increase efficiency with the automation of their workflow, the processes of creation, drafting, negotiation and execution of contracts. In addition, the social work we do at Bounsel gives us many satisfactions. It is bringing together all the facilitators of the Legal Tech ecosystem, because together we are stronger. I decided to enter the Legal Tech space because of the enormous changes in the legal sector and the importance of technology in that change. At our legal department, we made the decision to face these issues in a proactive way and, personally, it was a great challenge to accomplish. My greatest success comes from our team work capacity, seeing how a project succeeds after a big team effort. Also, our team effort improves the way we work and, makes our service improve. For me, the biggest transformation challenge is related to our traditional mindset: that the members of the team become involved in the change process, being able to feel part of the transformation and adopt it. As a lawyer with a background in behavioral sciences, I’m fascinated by the power of technology to free attorneys to focus on higher value work, like strategic and creative problem solving, and issues that demand insight and emotional intelligence. Also, while I truly love the world of law and digging into the complexities of legal practice, I came to understand I wasn’t as motivated to pursue the partner track. Legal tech has enabled me to have a broader impact in the world of law with a role that allows for greater creativity – and space for me to live a balanced life with my family. Working at the tip of the spear to modernize the business and practice of law, I have the opportunity to learn every day. We’ve achieved some remarkable successes at Nextlaw Labs, from increasing pro bono engagement and streamlining the often-chaotic M+A workflow, to collaborating with clients to launch companies, designing bespoke solutions to address key client challenges, and accelerating visionary legal tech startups in the Nextlaw Ventures portfolio to drive industry-wide development of impactful solutions. But most importantly, working with leaders in the legal tech space also allows me to be a strong advocate for diverse teams, produce solutions less afflicted by design bias, and support legal tech initiatives that improve access to justice and influence the future of legal education. Change management, without question. Driving innovation in the legal profession requires selling a 16th century guild on the benefits and mandates of the 21st century, and it requires strong people skills to encourage enthusiasm for that evolution in a risk-averse and ROI-focused environment that doesn’t recognize the need for change. This challenge has remarkable overlap with current efforts to address gaps in the industry’s understanding and support of EQ and gender equity. As technology begins to take on more of the tasks within the profession that can be automated, the most successful attorneys will be those who exhibit attributes that have been traditionally considered “female” – like empathy, flexibility, and the ability to collaborate. While these realities are becoming more widely acknowledged, It’s still a steep climb until such traits are recognized as critical to success in the legal industry. I founded AsiaLawNetwork.com in 2014 because of my personal frustration of not being able to find a suitable and affordable lawyer at the time I needed one the most. At that time, I also saw a jarring gap between lawyers and technology that desperately needed to be bridged. In adopting technology, lawyers can work more efficiently and be freed to focus on the most important aspect of their job: lawyering. Subsequently the desire to increase lawyers’ efficiency and effectiveness saw the founding of Tessaract.io, a practice management system that is designed for absolute efficiency and refined control of tasks. Lawyers who adopted the system saw their daily tasks become more efficient and thus increasing their productivity. My biggest satisfaction comes from the fact that we have built a brand that people can trust and rely on. The team has worked hard to make sure we are there for everyone that comes to us, and being consistent in that has been so difficult as it means sleepless nights and prioritizing our users’ problems. We are extremely privileged to have law firms from across the region come visit us in our office during their tour of Singapore after meeting up with the Law Society of Singapore and Singapore Academy of Law. Our greatest challenge now is how we scale across the Asian region, which is huge in itself as it is multi-language, multi-cultural, with different judiciary systems. Most Legal Tech companies focus on English speaking countries as it’s easier to access, but because of our mission, we want to reach the communities that have more needs and lesser available help. It will be an incredible journey! I created LegalUp with a mission to free up lawyers’ time from repetitive work and manage their accumulated knowledge so they can focus on what they do best: adding real value to their clients. The realization of my vision for the future of law: we manage to convince top law firms in Israel to use our platform not only internally as a knowledge management tool (as our other hundreds of clients do), but also as a unique online marketing to showcase their innovative attitude and generate leads. In a world where only 8% of the startups founders are women, I am thrilled that I had the chance to follow my passion and dreams and lead a Legal Tech company. I’m an experienced attorney who feels very passionate about the immense positive impact that the integration of the law and technology can generate. This is why after having practiced securities and corporate law for seven years in two leading law firms in Israel, I became a Legal Knowledge Manager and Head of Legal Technology Implementation at Fischer Behar Chen Well Orion & Co (FBC & Co), one of the largest law firms in Israel, which has been at the forefront of legal innovation in Israel and is regarded pioneer in the field of legal knowledge management and innovative legal technology in the Israeli legal arena. While the Israeli legaltech industry is still in its relative infancy, it seems that the realization that change is inevitable and will happen faster than expected is starting to penetrate the Israeli legal scene. In a country where innovation and entrepreneurship are native languages, it is only natural that the Israeli legaltech market will soon start living up to its “Startup Nation” legacy. Two years ago, I attended a legal innovation conference in Europe, where I heard an interesting expression that ‘Change has never happened this fast before, and will never happen this slowly again.’ It made me think about the local legal industry in Israel, which has traditionally been slow to adopt technological advances compared to other countries worldwide where legaltech is progressing at an accelerated pace. This phrase inspired me to get involved in the Global Legal Hackathon initiative and organize the first legal hackathon in the country in 2018, which I was hoping would contribute for the cause of raising awareness in the local legal scene as to the benefits of integrating technology in the legal sphere. I was fortunate to organize Israel Legal Hackathon for the second year in a row, which was hosted several weeks ago in Tel Aviv by our firm FBC & Co in collaboration with Tech&Law Israel as part of the Global Legal Hackathon initiative spanning over 45 cities around the world. Nearly 150 people participated in Israel Legal Hackathon 2019 and it’s been an amazing experience of incredible teamwork, creative ideas and solutions with potential impact on the global legal industry. The hackathon has certainly spurred interest in the legaltech field within the local legal scene, and marked a new chapter in its development. To me this is a personal highlight of my professional accomplishments. I am proud to represent ‘Startup Nation’ in a remarkable global legal innovation event such as Global Legal Hackathon, and honored to have been selected as Israel’s ambassador for the Global Rise Of Women in LegalTech (GROWL) initiative aimed to support up-and-coming women leaders in legal innovation around the world. 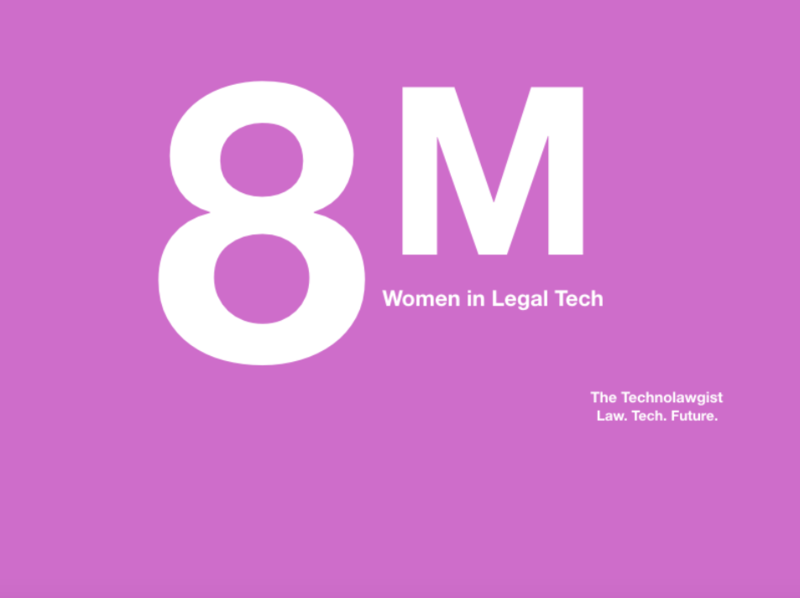 With only 8% of technological ventures in Israel led by women, and being the only female professional in the Israeli legal scene whose role is entirely dedicated to the integration of knowledge management and technology in the Israeli legal practice, I hope to encourage more women to get involved in the legaltech community world-wide and to do what they feel passionate about. Change management is always a challenge, especially within the legal industry which in many ways is a backward looking profession primarily built upon past precedents. This type of a mindset doesn’t necessarily encourage innovation in general, let alone adoption of disruptive technology. In fact, for a profession that is traditionally risk averse, innovation naturally pushes lawyers out of their comfort zones. As Jack Welch (longstanding CEO of General Electric) observed, organizations are at significant and potentially irretrievable risk when the rate of internal change is slower than the pace of external change. In my opinion, in a world where a pace of change is so fast, innovation should be viewed as an opportunity rather than a threat to the legal industry. In order to succeed as a law firm operating in the new economy, I believe that firms should be more open to experimenting with innovative initiatives, including new technologies, and adopt an organizational mindset that supports an innovation-friendly environment. Focusing on solving a particular problem could be a good way to start an innovation journey, while engaging employees and clients of the organization throughout the entire process in order to accomplish a successful innovation initiative. Prior to starting Helix legal I spent 6 years as a partner in a national law firm, I was the first female partner in the Queensland office and the youngest appointment to partner the firm had ever made in its 50-year history. I worked relentlessly to achieve what I though the pinnacle of a legal career was – equity partnership, a corner office, a seat at the table. The trouble was that it was overwhelmingly apparent to me that the world was changing but the law was not, to the detriment of lawyers and clients. I wanted to create a team of fresh legal minds that delivered solutions in a way that made the most sense to the client’s existing business structures. I didn’t want to turn a blind eye to the disruption that was occurring in other industries. I wanted to find ways to use technology to heighten lawyers’ ability to serve clients and create a flexible, supportive workplace that encouraged collaboration. Even without a history in tech, it was obvious to me Legal Tech was the way to achieve the business goals I set for Helix. Part of my journey of using tech to achieve my business goals has involved the discovery and development of our very own technology which now has a life of its own as LawLancer. LawLancer is a digital marketplace that connects legal service providers with law students to undertake legal research on a freelance basis. Late one night in the office in the early days of Helix Legal I found myself longing for the access I had enjoyed previously to passionate and smart clerks who could help me with some of the heavy lifting of research on my case. I had been using the freelance economy to build a virtual marketing department of sorts for Helix Legal and found myself wishing that a similar platform existed where I could access students. It didn’t exist at the time and so we started building it – www.lawlancer.legal. The biggest challenge is accepting that there is no way I can know everything. Selecting the right people who are absolute experts in their niche area is the only way to go. I decided to enter the Legal Tech sector because I was persuaded that incorporating sophisticated technological solutions and large amounts of creativity would result in the delivery of significantly better legal services. Services much more focused on the clients’ real needs and that are able to provide legal professionals with greater wellbeing in their professional practice. Legal Tech has opened the doors to the freedom and flexibility I was looking for. Without a doubt, my greatest success has been founding The Technolawgist. I have found a team of ambitious professionals who are as passionate about Legal Tech as I am. Now I wake up every day at 6 in the morning with an overwhelming passion, I want more hours in my day to make this company grow. Knowing that every day I contribute to the transformation of the legal sector and bringing Legal Tech closer to lawyers from all over the world is a real privilege. From my point of view the biggest challenge we are facing right now all those who firmly believe in Legal Tech is how to change mindsets. We need to break old inertias and abandon the burdens that keep the sector stagnant. The implementation of innovative strategies requires adopting an innovative mindset and being willing to embrace change. Let go of the fear of what others will say and simply act, experiment and move forward. I’ve always liked technology. Not so much at the programming level, but as a user. And law is my life, being honest. So it was simply the natural consequence of doing what I really liked. I think the historical and cultural importance of law, with the appearance of a new element as technology, gets its perfect combination to evolve in our society. Without law, technology becomes a tool without control, and law without technology creates a blind and deaf system. ts relative, being honest. It depends on what we understand as “success”. In my position, I would distinguish two: my greatest professional success is to manage with 31 years old the worldwide strategy of a firm like Pinsent Masons. It’s a huge responsibility and a constant challenge, but when you like what you do, you don’t feel such pressure. On the other hand, my greatest personal satisfaction is the human team I work with. Having some professional experience makes you appreciate your team on top of your work position. I’m immensely lucky to work and learn every day from incredible people and excellent professionals. Working as a lawyer in a new sector, full of uncertainties, makes us repeat the same questions: Will this be the best decision? The best choice? Not having a pre-established path makes us think that we are on the edge of an abyss. That’s why our team is important. The advice and experience of my team is pure gold. Facing those challenges alone is not only complicated but not necessary. Everything is easier if we have company. I’ve always been interested in the way technology and legal work together and have felt the pain of the monotone, time-consuming tasks that we face as lawyers. Ever since I discovered that innovative companies are coming up with ways to decrease workloads and improve access to legal resources, I knew that I wanted to be part of it. Hearing how the technology is adding value to our customers at Juro, an AI-enabled end-to-end contract management provider headquartered in London, and seeing a positive change in their attitude towards legal tasks – especially from non-lawyers has been my biggest satisfaction so far. I also really enjoy having direct contact with the customer and the amount of responsibility that brings – it’s not something I would be exposed to early on in a traditional legal role. Coming from a purely legal background, I still have to learn a lot around the technological aspects of the profession. You need an understanding of how different technologies work and interact with each other when speaking to customers and it can be a challenge to stay on top of all the current tools and systems companies use. Like many entrepreneurs, I was driven to enter the legal tech space out of frustration – frustration with all the walls in law – walls between law and technology, walls between law and other disciplines, walls between business professionals and legal professionals, walls between schools of different rank and from different countries, walls between academics and students, walls between lawyers and their clients. So (along with the help of tons and tons of other people) I set out to create LawWithoutWalls, which, as its name implies, is designed to break down all those walls in law and we use technology in many different ways to help us do that. When LawWithoutWalls [LWOW] was first introduced, there were no other law school programs dedicated to teaching innovation and design thinking to aspiring and practicing lawyers (let alone in a part-virtual, experiential learning format). Many thought I was crazy and that LWOW was “fluff” because it was team-based and focused on teaching what might pejoratively be called “soft” skills like collaboration, leadership, cultural competency, mentoring, empathy, audacity, intrapreneurship, listening, communication, giving/receiving feedback, business acumen. (Note: LWOW also focused on “hard” skills as well like project management, technology, and business planning etc.) Importantly, LWOW was purposefully team-based because all of the skills at its aim are the kind of skills that cannot be honed in a typical classroom format and are essentially to providing the type/kind of service that clients today require. My biggest satisfaction comes from the fact that today, we are not alone. Since we began in 2011, law schools from around the world have created programs designed to teach similar skills to their students and to practicing lawyers. My greatest challenge is convincing lawyers to learn how to innovate even if their business model is not broken. My research suggests that the call for innovation is really a call for a transformation in the kind of service lawyers provide. This is because in the process of learning how to innovate, lawyers adopt the mindset, skillset, and behaviors that add value and, importantly, delight clients. I entered the Legal Tech space because I saw firsthand how complicated the U.S. judicial system is while working at the U.S. Justice Department out of school and knew I wanted to do something to increase access to justice. At Paladin, we’ve build a tech platform that helps legal teams run more efficient pro bono programs and ultimately increases the amount of pro bono being done to help those in need. I’m thrilled to share that in our first year, every single partner on Paladin’s platform (corporate in-house teams to start) increased their pro bono engagement from the prior year. Some of them even launched their first formal program using our software! This means that we’re helping more immigrants, domestic violence survivors, low-income entrepreneurs, etc get the crucial legal assistance that they need. Unlike in other industries, in a world in which the billable hour rules, efficiency is not always a strong driver for innovation. There’s a lot of education that goes into helping partners understand all the benefits of Legal Tech, which is great to explore but can definitely be a challenge! The SEC’s Digital Asset Guidance: A Regulatory “Genesis Block”? Incendio en Notre Dame: ¿Debemos reconocer personalidad electrónica a los robots?